For many people, the automotive sector is a determinant of a country’s economic power. If you do not produce car brands that are known worldwide, then you mean nothing. France, once a global leader in car manufacturing, may soon fall out from the elite, as its contribution to the world’s automotive market is dramatically decreasing. It is one of the many signs how weak French economy has become with the euro adoption. A dying industry can be a spark that will set on fire the whole country; or the European Union. Industry is one of economy’s pillars and it has become clear that we cannot create national welfare without it. It is industry where innovations are developed and real growth is achieved; growth based on real wealth, not financial operations. It has also turned out that a strong manufacturing sector prevents an economy from deeper stagnation, which happened to France. 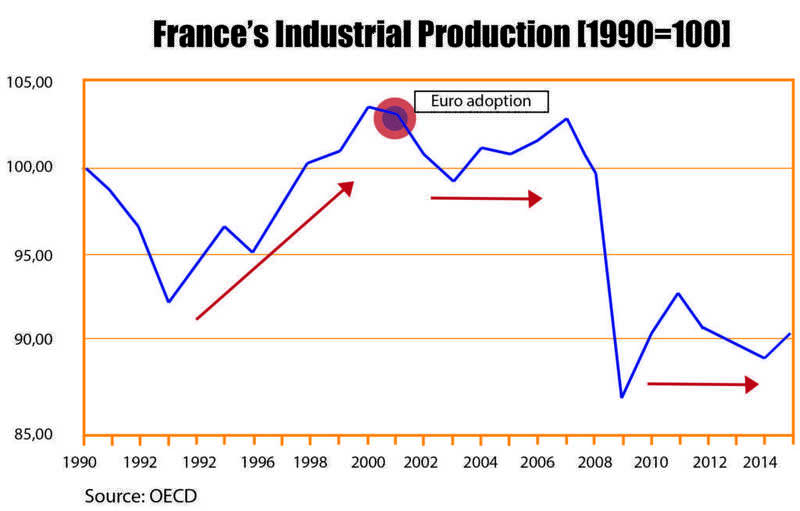 French industry has been contracting since the adoption of the euro. It was not able to recover after either of the 2001 or 2008 crises because the euro, a currency stronger than the French franc would be, has become a burden to France’s economy. The floating exchange rate works like an indicator of the strength of the economy and like an automatic stabilizer. A weaker currency helps to regain competitiveness during a crisis, while a stronger currency supports consumption of foreign goods. China has been accused of artificial devaluation of its currency to prop up exports, while the ECB’s policy has had an opposite effect for the economy of France and some South European countries: the euro has become too strong; whereas for Germany’s it has become too weak. That is why the common currency has increased consumption and imports in less productive countries and strengthened German competitiveness and exports. 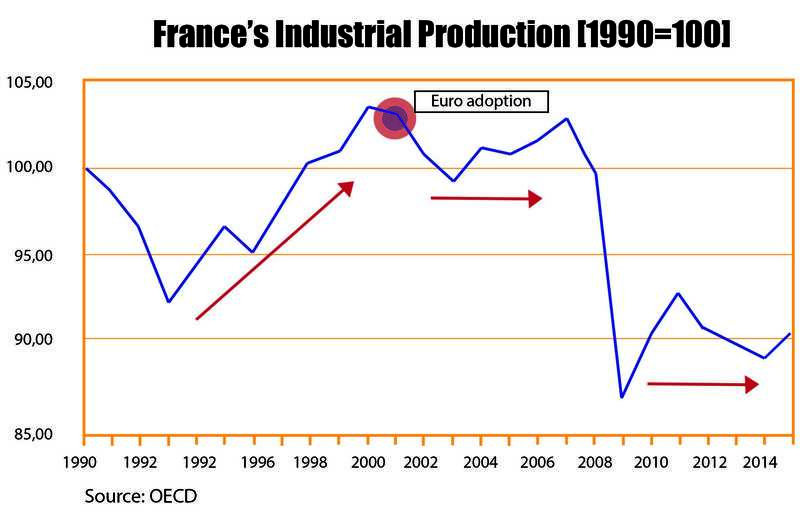 Because of the euro France could not regain international competitiveness in the world’s market after the 2001 crisis, so its industry has been slowly dying ever since. What we are saying is not that weakening your currency is a solution to boost a never-ending growth. The floating exchange rate is a great tool for bad times, which is excellently known in Poland, where there was no recession because of, among others, a temporarily weaker national currency. France and South European countries have just given this tool over to the ECB and they were not able to have a quick recovery. Just like Germany has had with an undervalued euro in their case. Today, according to the Eurostat1)EU Industry accounts for just over 19% of total gross value added and 15% of employment, Source: Eurostat 2016-10-27, industry (except construction) makes up 14.1% of the French total gross value added, while in 1995 it was 19.2%. The EU’s average is still 19.3%, but in Germany 25.9%. Moreover, the share of industry in total employment in France is only 11.9%, also under the EU’s average (15.4%) and the German level (18.8%). 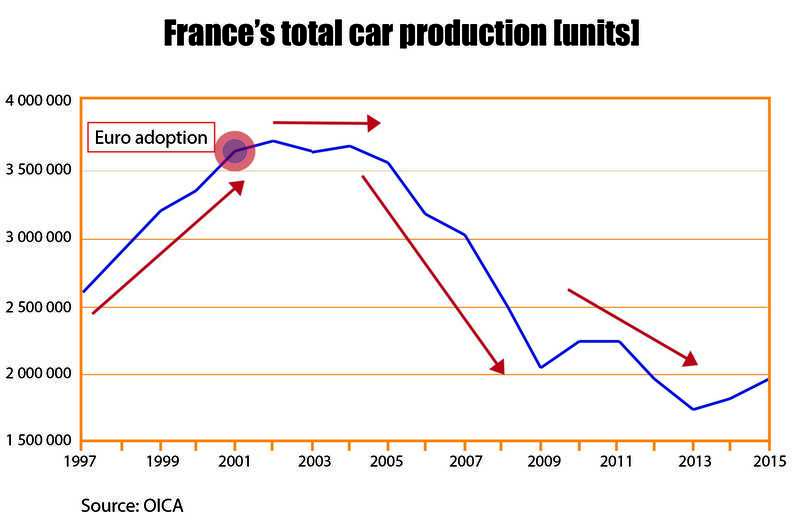 One of the imprints of the dying French manufacturing under the ECB rules is automotive sector collapse. According to OICA data, the world’s car production almost doubled in the years 1997-2015 from 53 million vehicles produced yearly to 90 million. At the same time, Germany increased its car production by 20% from 5 to 6 million. 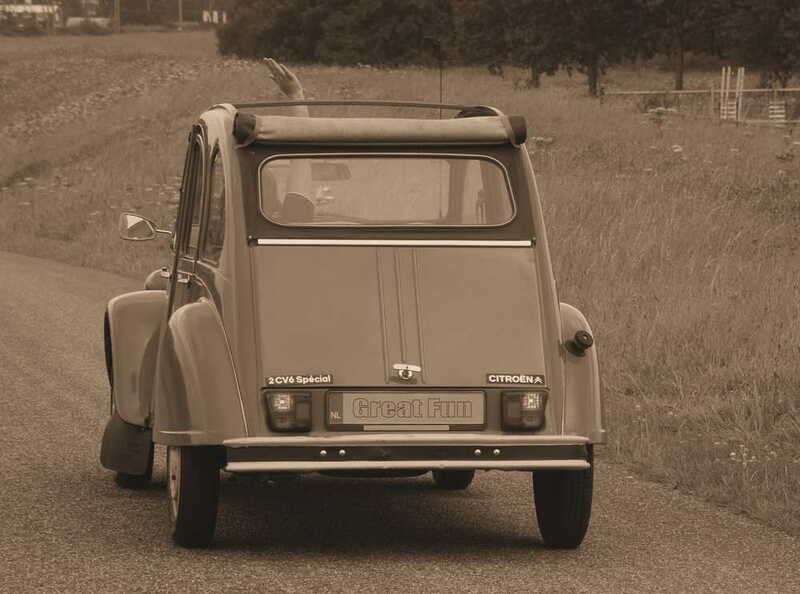 What happened in France, once the proud producer of beautiful and modern vehicles? 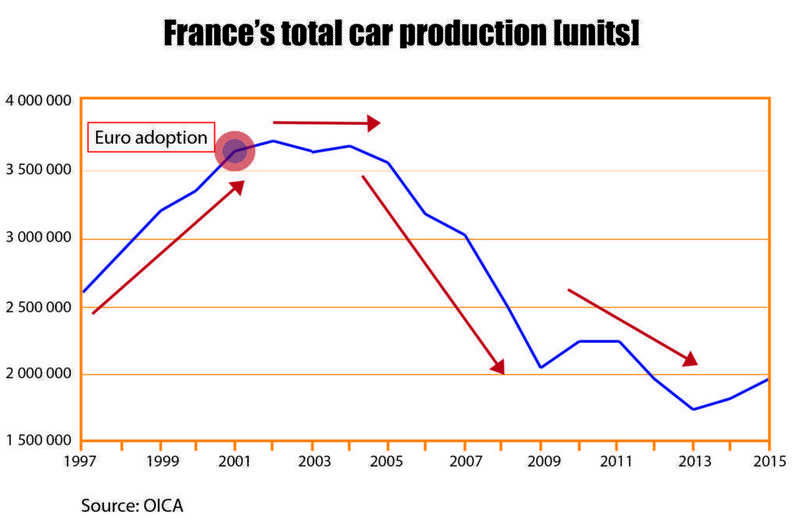 Not surprisingly, car production in France almost halved from nearly 4 million to less than 2 million. And again, stagnation and collapse occurred just after euro adoption. Obviously, France has been pursuing a very social policy and its market is highly constrained by the excessive legal regulations. However, trade unions in Germany are also very strong and yet the manufacturing sector has not collapsed. A dying industry is a huge problem not only for French economy but also for society. The strong revolutionary sentiment may spark off extreme riots, also with a racial background. France has one of Europe’s largest Muslim immigrant populations from Africa that is still growing. Without jobs in the industry France will not be able to offer these people any perspective. The longer the industrial stagnation lasts, the bigger the chances are that France will one of these days destroy the common currency union. The car industry itself … is responsible for the car industry’s demise. Using the car does not pay for the car, nor does using the car pay for the fuel or the roads … what pays in France and elsewhere in Europe is tens of billions of borrowed euros, plus billions more of government borrowing to service that debt. France gobbles a million barrels of imported fuel every day paid for with loans. Now the banks want their money and the only source of repayment is new loans. Certainly not driving from nowhere to nowhere in endless circles. 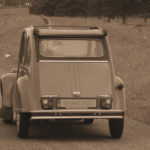 The French have a choice: they can voluntarily give up the automobile and take the time to re-learn how to actually live. The French will discover they like being car-free. Alternatively, the French will be bankrupted by their toys and forced by desperate necessity to give them up. Seeing as half the industry has collapsed, that ‘day of necessity’ is not too far off.